This year, the legendary and revered Williamstown Theatre Festival in Massachusetts is opening its 62nd season with a production of Tennessee Williams’ classic The Rose Tattoo. Winner of the 1951 Tony Award for Best Play, this dark comedy is directed by Obie Award-winner Trip Cullman and is playing on the Festival’s Main Stage now through July 17th. 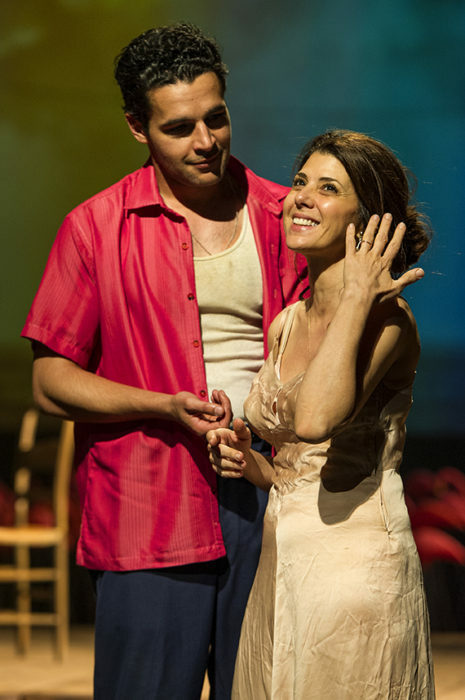 The last time that Marisa Tomei tapped into her Italian background to bring a character to life, she won an Academy Award. This time around, the My Cousin Vinny star plays Serafina, a Sicilian immigrant in Louisiana who can’t seem to get back on her feet after the death of her husband. A recluse in her own home, she can barely get dressed and spends years drowning in memories instead of trying to create new ones. Because she’s the only local seamstress, Serafina is on the receiving end of the anger and frustration of neighboring women because she doesn’t bother to fill orders in any sort of timely fashion. As a ferociously devout Catholic, her go-to source for advice, clarity, and purpose, is an old figurine of the Virgin Mary. Her religion also acts as the lens through which sees people – like the village idiot, who she claims must have shaken hands with the devil because of her crooked nails. Then there’s her teenage daughter’s sailor boyfriend. As soon as Serafina meets him, she makes him get on his knees in front of the Virgin Mary figurine to swear to not take advantage of her child’s innocence and return her home with her virginity intact. Complete with a thick Italian accent, Tomei portrays Serafina as a frantic, emotionally unraveling woman, who at the same time is loud, in-your-face, energetic and full of sassy zingers. This makes her clashes with the townspeople and her overbearing relationship with her daughter hilarious to watch. What Tomei so impressively does is use Serafina’s pain to create a fiercely comical character whose outrageous, highly entertaining, and ultimately heartwarming roller-coaster journey is nothing short of a comedic master class. As Yoga Jones in Orange Is The New Black, Constance Shulman gives off a very mellow, calm, and peaceful presence. In The Rose Tattoo, however, she gets to show off a whole new side of herself. As The Strega, Shulman is outlandish, crazy, and above all, a huge gossip. Physically, she’s disheveled and looks like a cross between a witch from Macbeth and a pirate from a Tim Burton film. Whether she’s chasing the goat or giving foul-mouthed recaps of the goings on she’s seen about town, Shulman steals every scene she’s in with her ridiculous antics and biting banter. In Act II, the grieving Serafina decides to give love another chance when she meets the handsome, younger Alvaro Mangiacavallo (whose last name literally means “eat a horse”). Alvaro, immediately smitten by the widow, goes to extreme lengths to convince Serafina to open her heart again. He even gets a rose tattoo on his chest like the one that her dead husband had. To Serafina, Alvaro has the same body as her ex (but with a “clown face”), and she takes this as a sign from the Virgin Mary to allow him into her bed. The affair that ensues becomes an increasingly over-the-top, uproarious series of dramas and misgivings. Tomei and Abbott carry the comedy beautifully, while also having palpable sexual tension and chemistry. It’s impossible not to root for them. Stage veteran Lindsay Mendez sings various Italian songs to set an array of tones throughout the show. Mendez – whose impressive credits include Significant Other,Wicked, Dogfight, Godspell, Grease andEveryday Rapture – has a soaring and evocative voice that adds texture and depth to whatever Serafina is feeling at the moment of her next scene. Her emotional, soulful delivery of this music is worth the price of admission alone, and it powerfully ties the play together in a simultaneously stunning and intelligent way. Mark Wendland’s meticulous scenic design brilliantly transforms the stage into a genuine Southern coastal town. Extending through the orchestra of the theater is a wooden catwalk that immediately morphs the venue into a boardwalk. The way that Serafina’s house is anchored on its side allows audience members to clearly see her when she goes inside without sacrificing the feeling that they are surrounded by the beach. 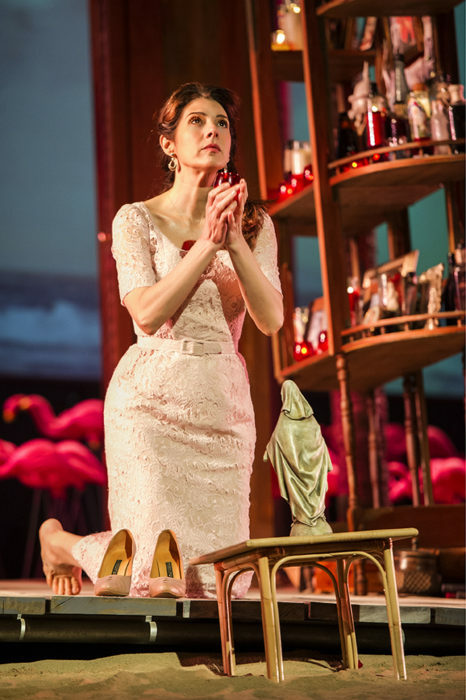 The stage is covered in sand, and Serafina’s waterfront property is adorned by dozens of pink flamingos. The flamingos aren’t real, but the show does feature a live animal. 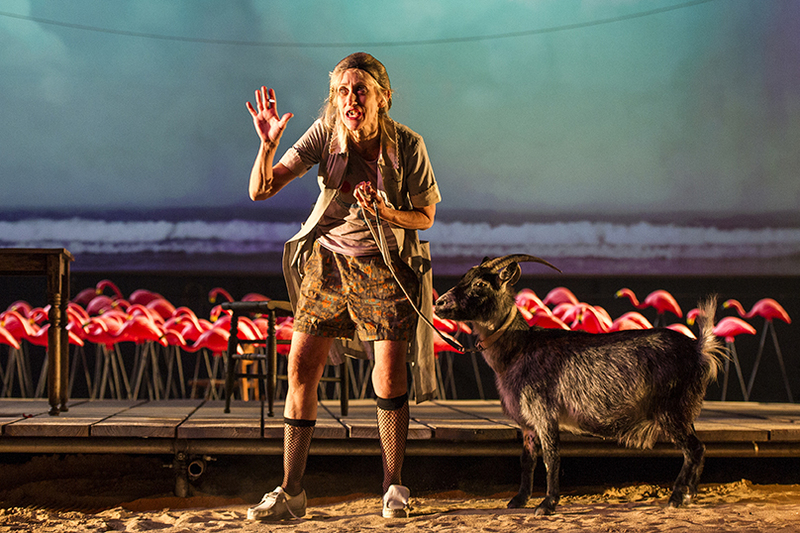 A goat makes several appearances on stage, acting as a symbol of Serafina’s intense sexual feelings – whether it is when she remembers her husband or thinking about the temptation of Alvaro. Wrapped in the backdrop of the set is Lucy Mackinnon’s projection design of a beach. Throughout the show, the waves constantly crash against the shore, making the audience forget they’re even inside. As the days turn into nights, the beach gets darker and the clear blue water turns into a black abyss with glowing foam washing up in front of it. This produces a truly transcendent effect, which will make you want to drive straight from Williamstown to Cape Cod. Click HERE to purchase your tickets to The Rose Tattoo, now playing at the Williamstown Theatre Festival in Williamstown, MA through July 17th.